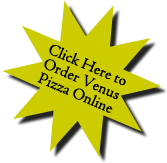 You can now get your Venus Pizza fix without even picking up the phone! CLICK HERE to order Take-out online now! Venus Pizza has been serving quality food to New Westminster residents for over 40 years. We’re #1 for a reason! We have the best selection in town and give a quality product for a good price! Pick ups from Rivers Reach Pub must be over 19 to enter premises. 2 pieces of government I.D. required. If you are under the age of 19 please ask phone operator to make other arrangements for pick-up. Dont forget to pick-up a 6-pack or bottle of wine with your take-out! 320 6th Street, New Westminster B.C.